Jay Begg is a lifelong resident of Allen County and the sixth generation of his family to live on and manage the family farm in Monroe Township. Jay and his wife Stephanie have raised five children and have ten grandchildren. Jay is a graduate of Columbus Grove High School and attended The Ohio State University at the Lima campus. A 4-H member for ten years, Jay exhibited dairy cattle at the Putnam County Fair and was active in the Allen County Dairy Service Unit, selling milk in the Fair Booth, beginning at age 8 or 9 and serving later as Treasurer of the organization. Jay is a Director of the Allen County Cattlemen Association, served as President and is a recipient of The Cattlemen’s Outstanding Service Award. A longtime member of the Allen County Farm Bureau, Jay served as the County President for four years. As the Farm Bureau’s representative on the Ottawa River Coalition, Jay served as Chairman of the Coalition in 2004. A graduate of the 1994 Allen-Lima Leadership Class, Jay has served on the Allen-Lima Leadership Board of Directors. His community service also includes time spent on the Lima-Allen County Chamber of Commerce Board, the West Ohio Food Bank Board, Lima-Allen County Convention and Visitor’s Bureau, the Columbus Grove School Board and the Ohio Fair Manager’s Association Board of Directors. 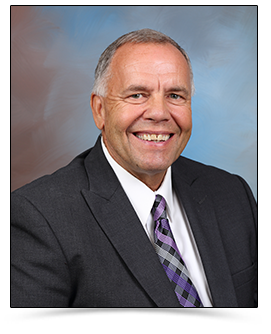 Jay joined the office of Commissioner following his retirement from his position as Fair Manager and secretary of the Allen County Agricultural Society. In that role, he managed Fairground operations, including the annual Allen County Fair activities. He’s been very active in the operation of the Allen County Fair for many years. He’s worked as a 4-H advisor, assistant superintendent and a Director of the Allen County Agricultural Society for nine years before becoming Fair Manager.